South Africa defence coach Richie Gray - whose namesake plays in the Scotland second row - said the Springboks' win on Sunday saw them destroy a "myth" about their breakdown play. 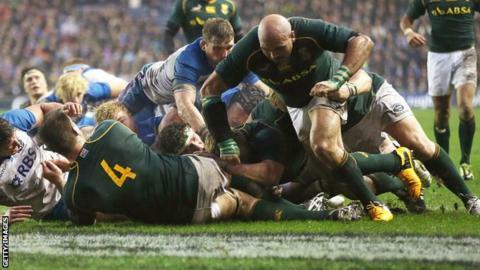 Gray, who is Scottish, had "mixed emotions" as the Springboks powered to a 28-0 win at Murrayfield. The Galashiels man was brought in as a "breakdown consultant" to help the Boks improve their rucking technique. "Suddenly, you saw body positions that were outstanding," he said. "I think the big thing is there's never been a huge emphasis on the breakdown in South Africa. "It's always been very much a maul, arm-wrestle type game, big scrummage, quality line-out and then squeeze the life out of you. "The quote from northern hemisphere to southern hemisphere, especially aimed at the Springboks, has always been take them on at knee height, don't whatever you do take them on at waist height because you'll always struggle there, but they can't bend, they're not accurate enough. "The main aim of the whole eight-nine months that I've been with them is trying to destroy a myth really - that's what we say to them, let's destroy a myth and let's have nine months to do it." Gray was appointed in August to assist head coach Heyneke Meyer as a "breakdown consultant" for the Rugby Championship and their end-of-year tour to Britain and France. The 43-year-old has had an instant impact, with the Springboks winning more ball on the ground than any of the other sides - including New Zealand - in the recent four-team southern hemisphere tournament. Gray revealed Scotland had exposed South Africa's weakness on their home soil in June, when the visitors' superiority at the breakdown took them into a 17-6 lead before the Springboks bounced back to rescue a 30-17 win in Nelspruit. "Remember Nelspruit was the benchmark - that had to be washed away," he said. "It has been an interesting week and, when you come back to take on your own country, there's a real lot of mixed emotions, but you take all the emotion away from it and just look at the rugby. "You were brought in to do a job with this team and it has been an absolute honour to work with them throughout the Championship, against Argentina, Australia, New Zealand, and then obviously on this northern tour. "The pressure that you're under in that country is incredible - 50 million South Africans who are absolutely rugby daft - and sometimes winning is not good enough. You've got to win well. "I was delighted in patches. I wasn't too happy with other things in the game, but on the whole it was a good performance." Having defeated Wales then Scotland, the South Africans head for Paris with a spring in their step after having lost only twice - to the world champion All Blacks - in their 11 matches during 2013. Head coach Meyer had some consoling words for the battered Scots. "They're very physical, they kept on going," said the head coach. "We had to work hard to stop their drives. They're very physical, very good at the breakdown. "But I really thought we made a big step up, especially in these conditions - the rain in the second half was a wee bit more difficult. "If we win in Paris, it will give us an 80%-plus record for the year and there have not been many occasions when the Boks have managed that in the post-isolation era, so I will be very happy with that."